My gluten-free experience started a few years ago when my daughter was having health issues. Her condition had not been diagnosed so I felt that we should try to eliminate the usual suspects in an attempt to ease some of her pain and discomfort. I would never ask a 14 year old to make such a drastic dietary change alone and gladly gave up bread, pasta, and yes, beer. My daughter was gluten free for about two weeks and I decided to give it another two years. I had read "Wheat Belly" by Dr. William Davis and "The Grain Brain" by Dr. David Perlmutter and was aware of the history and the effects of industrialized, hybridized wheat. Knowing this information made me more than determined to kick the wheat habit. If you haven't read either of these two books, I highly recommend them both. It was not hard for me. I did not buy into all of the gluten free foods that had started to fill the grocery store shelves. Most are filled with starches and other fillers that I did not want to include in my diet, much like the gluten that I was trying to avoid. I did chose a diet high in fresh fruits and vegetables, healthy fats, and protein. Because I like to bake this change did feed my natural curiosity of how one could make delectable pastries and desserts without using flour. Through that quest I now have an array of healthy foods that are used to substitute white flour that I might have never tried. Cauliflower as a pizza crust, almond flour, black bean flour, and one of my favorites, walnut pie crust, just to name a few! I found that I could still enjoy delicious treats on a gluten free diet (but had to watch the sugar)! It was close to six months when I started to really feel the effects of this lifestyle change. I had lost a little bit of stubborn weight, my skin had a healthier glow, and I had a sense of real clarity. So, why have I gone back after clearly experiencing the benefits to my own personal health? Because there are some foods that I wanted to enjoy and create! 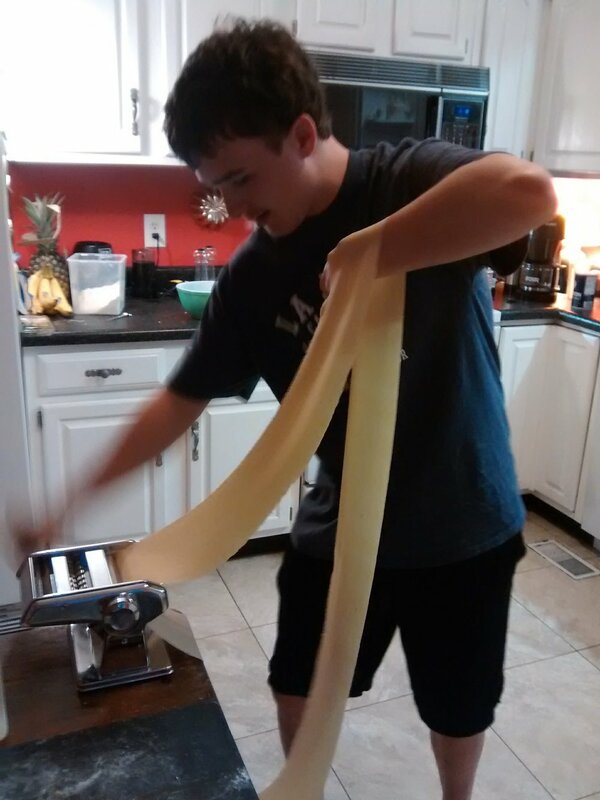 It's hard to resist eating homemade pasta after spending a beautiful day in the kitchen with my son (that photo above)! Or on a trip to NYC last year with my oldest I declared there was no way I was going to search for a gluten free bagel in the Big Apple! It was all (an everything bagel with lox and cream cheese) or nothing! I left the city feeling no quilt. These experiences did not change my eating habits on a day to day basis. I think that when we begin to feel good, feeling bad is just not an option anymore, especially when it is something we have control of. Feeling good to me is also about balance. Diet is a huge part of it but so is exercise, good sleep, stress management, and a lot of laughter. Through my own life experiences I am aware of how different foods affect my body and I have the ability to respond accordingly. With that I am choosing to use high quality wheat products like King Arthur flour to make bread, pasta, and pizza crust. I also choose moderation. Just because I am allowing these foods into my meal planning doesn't mean that I will eat them every day, three times a day. To be honest, it may only be once a week or even once a month. My daughter's condition was finally diagnosed. She is close to being fully recovered and living a very full and healthy life! If you are seeking balance in your own life, please contact me. I am a compassionate listener who can guide you through some of life's changes for a healthier and happier life!